This is the first book to contain, in one comprehensive volume, every molding and casting procedure of use to the theater props builder (no matter what his or her level or proficiency). The author demonstrates the techniques involved in using more than thirty different materials ranging from papier-mache to breakaway glass. 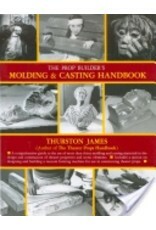 While the use of some materialsÃ¢â‚¬â€œplaster and polyester resins, for exampleÃ¢â‚¬â€œis covered to some extent in other publications, information on the selection and use of rubber materials (latex, neoprene, silicone, and the urethanes) and the procedure for making breakaway windows and bottles is available only inÃ‚Â The Prop Builder's Molding & Casting Handbook. Written in an easy, conversational style, the book will be useful to anyone involved with theater properties, puppetry, and costuming (as professionals or amateurs). It will also serve admirably the needs of students taking classes in those subjects. Completing the book is a special section on designing and building a vacuum forming machine suitable for use in constructing theater props. More than 450 photographs illustrate the step-by-step procedures explained throughout the entire text.